Tropical and Hawaiian Christmas music adds a touch of the tropics to your holiday celebrations. Planning a tropical themed Christmas party or holiday luau? Play tropical and Hawaiian themed tunes with some live music and holiday classics thrown into the mix. Tropical Hawaiian Christmas Music – What are Your Options? Hawaiian Holiday Music – Listen to holiday music with some island flavor. These tunes are a must, whether you’re heading to the islands for the holiday season, or celebrating a tropical themed Christmas at home. Steel Drum Christmas Music – Listen to Christmas performed with a tropical flavor. 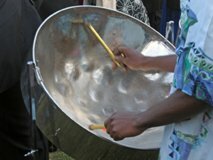 The unique sound of steel drums brings a touch of the tropics to your holiday celebrations. Jamaican Christmas Music – Celebrate a Caribbean style Christmas by adding Reggae music to your holiday play list. Beach Boys Christmas Music – The Beach Boys make you think of surf, sand, and the California sun. If you enjoy Beach Boys music, you’ll love their Christmas tunes. Classic Christmas Music – Classic Christmas music performed by timeless artists. Find music performed by Bing Crosby, Dean Martin, Frank Sinatra, and Gene Autry. Other favorites include James Taylor, Neil Diamond, Dolly Parton, Carly Simon, Barry Manilow, and more.